Mission: The Missouri State Board of Podiatric Medicine protects the public from incompetence, misconduct, gross negligence, fraud, misrepresentation or dishonesty; licenses only "qualified" professionals by examination and evaluation of minimum competency; and enforces standards by implementing legislation and administrative rules. Function: The Missouri State Board of Podiatric Medicine licenses podiatrists and regulates the profession of podiatry. The board reviews applications for licensure to determine an applicant's qualifications. 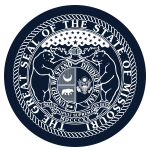 The board enforces the laws and regulations governing the practice of podiatry in the State of Missouri.